I love it when I get around to watching something and it's great and there are 5 seasons of it on Netflix. That's rainy winter nights sorted! 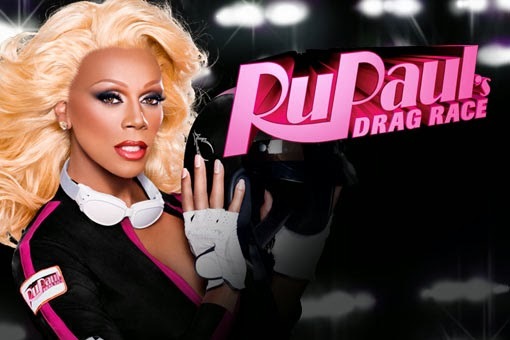 RuPaul is great - funny and sweet and fierce and full of charisma. I've only watched the first season so far and I loved all the queens who were competing. It was lots of fun. Now, may the best woman win! I love the idea of rejuvenating old favourites with some alterations - it's a great way of updating your wardrobe for less cash. I've got some plans in the works for a coat and a sweater, so I'll post once they're complete. Actually, I've been obsessed with sequins since I was about 6 years old, but I finally bought a Markus Lupfer sweater, so I have a fabulous expression of that obsession. I'd had Markus Lupfer on my wish list for a few years, but I've not wanted/couldn't pay full price, so I waited for the sales. Unfortunately, I always held out for the sweaters to go down to half price, which never happened because they always sold out. This year I settled for 40% off. I have another sweater with a sequin image on it, but the difference! 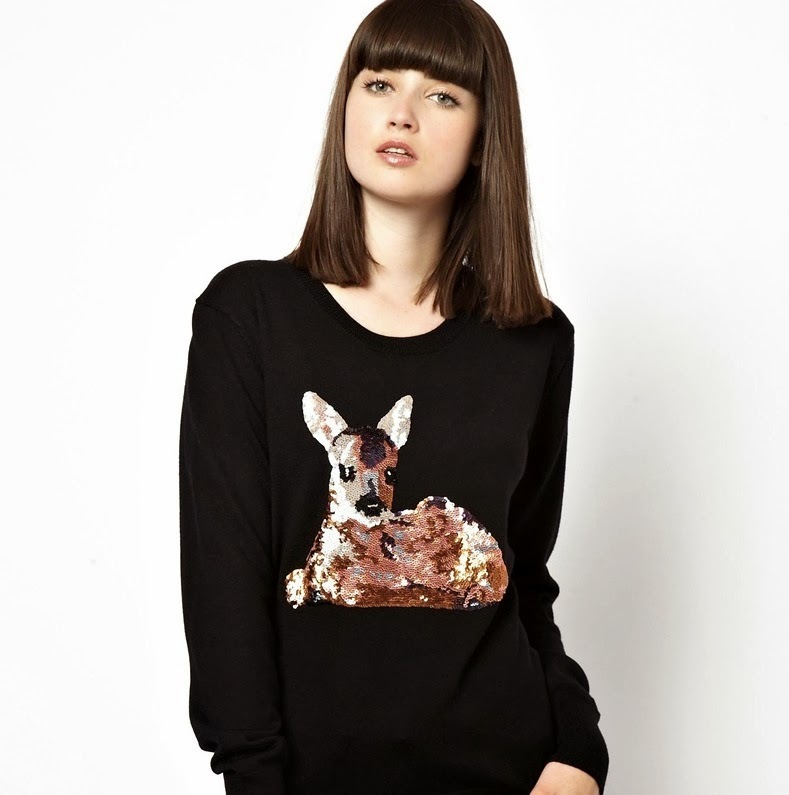 With the rich tones used, and the sheer number of colours, the little fawn on my Markus Lupfer sweater is like a work of art. Mine is now sold out, but you can still get sale sweaters at Matches, Flannels, ASOS, My-Wardrobe, Net-a-Porter, and bizarrely, Amazon. Nicolette Mason - not really a blog about decor, but she does cover it at times, and her home is really inspiring. That's not many, I know it's only scratching the surface. If you know of any other good ones - share! I know how that sounds, but I hadn't gotten a hair cut in over a year. I finally got one just before Christmas and it transformed my hair. I actually like it for the first time in years. I have body and fullness. I recently moved so I changed salons (I used to go to James Dun House in the City Centre, but now that I'm back in the West End I needed to change). I now see Caroline at Cresswell and Co. She's great, and there's no pressure to buy product. In fact, she even told me I don't need to use conditioner. She listened to what I wanted and did a fantastic job. So, now that I like my hair, I decided to treat myself to some ridiculously expensive product. 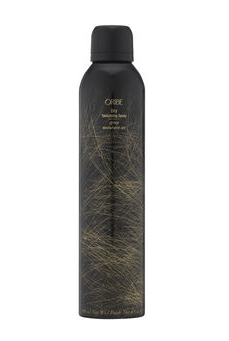 I bought Dry Texturizing Spray by Oribe. I had a voucher at Space NK as well, so it was £10 off. So, now, I'm thinking about the colour. Since I have put it up pretty much every day until my recent hair cut, I hadn't noticed how dark it had gotten. I don't like the colour anymore, so I'm considering home colouring. I'm worried though, because I have fine hair, that it will damage it too much. What to do? I can't decide. So I have to mull. Hence, obsessed. Feel free to weigh in on this. Any of you who have fine hair that you've lightened, let me know how it went.